Use this handy tool to check your stitch and row gauge for both knitting and crochet. Not sure what size needle or hook you have? 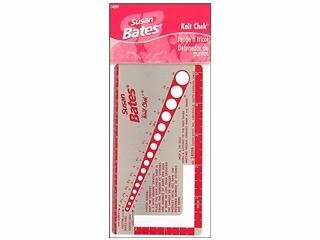 You can also verify the size of your needle or Susan Bates in line crochet hook from US 0, B-1 to P-16 (2.0mm to 11.5mm). Knit-Chek measures only 5-1/2x3in making it the perfect size for traveling or storing away with your other knitting or crochet necessities.